Comprehensive Health Care for all of Northwest Michigan. Same day appointments & walks in are welcome! Comprehensive medical care from our 12 healthcare clinics located throughout all of Northwestern lower Michigan. For acute illnesses, we offer same day appointments with convenient hours, including evening hours until 5pm Monday through Friday and Saturday hours from 9am-1pm at the Benzonia, Interlochen, Manistee, and Traverse City (Rosewood location) offices. We also provide after hours on call service through Paul Oliver Hospital in Frankfort Michigan. Call 231-352-9621. Ask them to page the doctor on call for Crystal Lake Clinic. 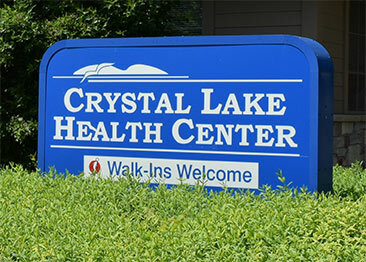 At Crystal Lake Health Center, we provide and coordinate comprehensive services for the entire family. Our staff of top physicians, physician assistants and nurse practitioners provide a full range of healthcare services for newborns, pediatrics, adolescents, adults and the elderly. Same day appointments and walk-ins are always welcome! Crystal Lake Clinic is pleased to welcome Scott Carlson, DO and Heidi Collins, FNP to our Manistee office and Maryann Smith, PA-C in our Bear Lake office. Photos coming soon!